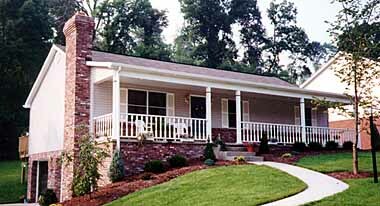 All the charm of a traditional country home is wrapped up in this efficient, economical ranch. The time-honoured three-bedroom plan can also serve as two bedrooms plus study or playroom. The great room provides a warm welcome to guests, while the open kitchen and family room combination offers plenty of space for active family gatherings. All in all, this plan adds up to a superb family home with lasting value! Main Living Area – 1,288 sq. ft.